Arthur then arrives to confront them for bringing the Dark One in and being super evil. Regina faces off with her awesome “bring it” stance with extra fireballs while Emma uses the spell on the tree. She frees Merlin who greets her by name. He also has a whole lot of scorn for Arthur – and he’s doubly unimpressed by Arthur’s posturing. To the present and Arthur is happily covering up his missing (dead) squire. Guinevere decides everyone needs hope so the Charmings suggest a dance since it also gives everyone chance to torment Henry about Violet (in addition to being terrible in every other way, let us also acknowledge what terrible grandparents they are – no-one wants granddad intruding in your love life). While they’re all poking poor Henry (this is the problem of extended families) Belle tells them that Rumplestiltskin is missing. Rumple keeps trying to tell Emma he’s a terrible hero – and warn her what it’s like to be the Dark One, how there’s always a justification for the dark magic that just gets you in deeper and drives away those she loves. Emma calls in the defiant Merida to get her working on Rumple but his words seem to have got through since she goes to a building full of dream catchers to cry over them. Merida tries to train Rumple how to fight, though with his bad leg he can barely stand. He keeps trying to beg off but she insists, of he isn’t a hero she can’t go home and save her kingdom and family. So she has to find a new way to make Rumple all heroic. She taunts him and eventually mocks him with Belle’s chipped tea cup, giving him something to fight for, something to cling to. She also says she plans to have Rumple take down Emma. We have to join Henry’s love life in the present – Violet has lost her horse and Henry decides it’s his job to find it for her. He intends to recruit Emma for the task for lots of nostalgia and acting like an actual family rather than dark magic and evil. They go find her horse through simple detective work rather than magic – though her dark woo-woo scares the horse but Henry lures it – and gives it Violet at the carnival they’re having only this time Sir Morgan likes him and is happy for them to go off together. She kisses him (on the cheek). While she’s distracted the rest of the gang go to Emma’s warded house but Belle’s brains and Regina’s magic easily get through the ward. They go in and find Excalibur – and see that it has the same design as the Dark one’s dagger. 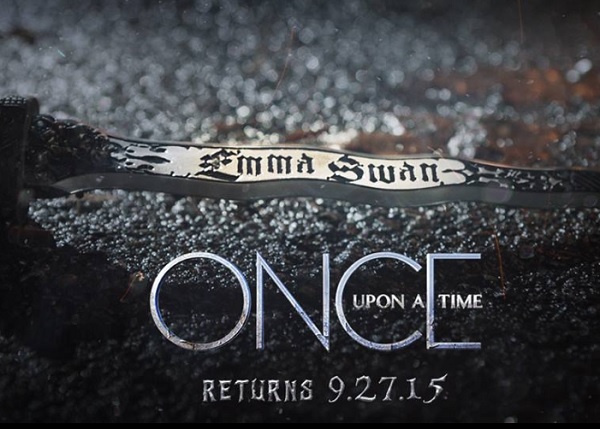 Regina has to stop Killian killing himself trying to drawn the sword. They also find one of her Dreamcatchers – with Regina telling them how powerful it is, and how Emma could have used it to steal their memories. They go to tell Arthur all since they don’t know he is evil. He does admit that Excalibur and the Dark One dagger are the same – and he says it can be used to destroy all dark magic, or all light magic. Everyone of course believes that Emma wants to destroy all light magic because Dark One and all. And Henry observes it all. Regina confronts Emma and begs her to try and come back. Emma won’t listen so Regina awesomely calls Emma out on what she did. Emma tries to hold up helping Violet find her horse as some kind of redemption – but Regina isn’t impressed, she knows how evil works and accuses Emma (accurately) of letting the horse out in the first place. Regina draws some painful but accurate comparisons between what Emma did to “protect” Henry and what Cora did to “protect” Regina. Emma reveals that Merlin has been freed and Regina doesn’t let her see Henry, saying he doesn’t want to see her. Emma and Regina are awesome together. I think the moment when Emma said she wasn’t Regina was a perfect example of this – it would have been easy to make this demeaning or belittling or insisting she was better than Regina, but when Emma said “with all due respect” she meant it, she meant every word – because they have a huge amount of respect for each other. Emma’s respect for Regina’s sacrifice of reliving Daniel’s death is also really powerful. They are so excellent together. So very excellent together. I also like how it depicts the path to evil. In some ways it’s power more than dark magic –it’s the short cuts that dark magic allows. When you have power it’s easy to manipulate your way to what you want because you have the power to get them so easily. Regina and Emma never failed to be epic. I also like how Regina’s loss of Daniel can be seen as heartbreaking AND not change how she feels about Robin – she can have more than one true love. As I’ve said before about Rumple, I don’t like that his strength/weakness is pretty much always depicted on whether he is disabled or not. When he has his magic and is powerful, he can walk. When he doesn’t have his magic, he has trouble walking and is weak. Ok that can be explained by the woo-woo. But now with Merida we seem to be going back to that, with Rumple “forgetting that he’s a guy with a limp”. A far better narrative would be Rumple REMEMBERING that he’s a guy with a limp – but realising that a guy with a limp can still be a hero. We don’t need to turn off his disability to make him a hero. We need him to be a disabled hero. Henry and Violet – I was generally neutral about this relationship but now I’m not all that thrilled. I don’t like the idea that Henry and Violet’s brief association and teenaged crush being on par with the epic love affair tragedies we’ve seen. I also hate that this super powerful heart break was brought on by, albeit coerced, “friend-zoning.” A guy is totally devastated because a girl wants to be his friend rather than love interest which gives them uber amounts of magical heart break? Yeah, I’m not loving this. And the Dreamcatchers. It’s problematic to draw upon elements of different cultures, to appropriate them but have no actual representatives of those cultures present. Though I don’t know whether I’m annoyed more by the depiction or worried about what Once Upon a Time would do with Pocahontas or Tiger Lilly.